What is man's greatest achievement? (CNN) -- Fire, the wheel and even cup noodles were among the varied answers to the question posed by CNN: "What is man's greatest achievement?" 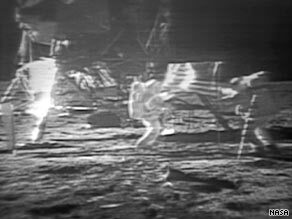 Man set foot on the moon on July 20, 1969. Was that man's greatest achievement? Have your say. CNN producers armed with cameras put the puzzler to passersby in Berlin, Madrid, Rome, Bangkok, Tokyo, New Delhi and Paris. In the lead-up to the 40th anniversary of NASA's Apollo 11 mission, more people might have been expected to nominate the moon landing as one of man's greatest feats. Alas not. One woman in Germany suggested the computer. "It has opened up my world. I can stay in my house and travel all over the world," she said. Fire also got a look-in. "Everything started there right?" said one man in Spain. There was agreement in Italy: "I think the most important is that man discovered fire because it's bringing a lot of life." The written word was also nominated in Italy, as were architecture and sanitation. "The biggest achievement of mankind? Music, right?" suggested one woman in Spain. In New Delhi, video games got one man's vote. "It allows you to be whomever you want, in whichever world you want, and lets you live an alternate fantasy life," he said. One hopeful businessman in Italy told us, perhaps prematurely: "Peace, I'd say peace. That would be the greatest achievement for all." What do you think is man's greatest achievement? Where does the moon landing fit in?